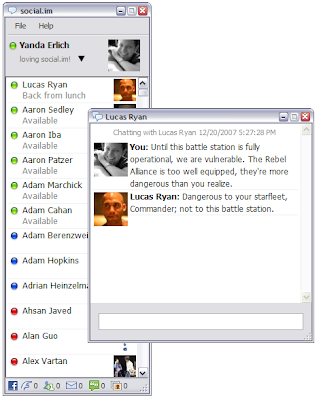 Social.im allows you chat with all your Facebook friends from one IM client. It's a normal IM client that grabs all of your Facebook friends via the Facebook API and put them into Social.im. Social.im is only available for Windows machines now but a Mac version is coming soon. The client is still on alpha stage so be ready for bugs. The client also shows other basic information about Facebook - new wall posts, messages, pokes, friend requests and photos tagged with your name.